How did everybody survive that snow this weekend? It wasn't too bad, now was it? I hope everyone remained warm, safe and with power. It was tough to blog about any happenings this weekend because businesses were mainly posting about events being postponed or cancelled! I figured people may be itching to get rid of that cabin fever, de-stress from finals week and have some fun. When searching New Haven events for Monday, December 16th, I stumbled upon this Monday Happy Hour Series, hosted by the New Haven Collective group on Meetup.com. It's a happy hour at Kumo Hibachi Steakhouse on Elm Street. Kumo holds a special place in my heart because it's the first place I tried "real" sushi (apparently California Rolls don't count). The food is fresh, the environment is pleasant, and the Monday happy hour meet up sounds like a sweet deal! The happy hour is open to all, "especially those who hate Mondays" and want to check out the local scene. 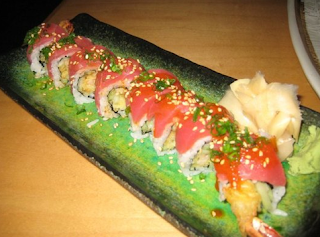 The specials include buy one drink, get one 1/2 off, and 1/2 off all rolls, special rolls and sashimi! Sounds like a good deal! Kumo is located in downtown New Haven at 7 Elm Street (across from WTNH building). They have a private parking lot and there is street parking along State and Elm Street. If you're looking to head out tomorrow, go for it. We're supposed to get more snow Tuesday!